Firstly please excuse my ignorance if this is common knowledge. 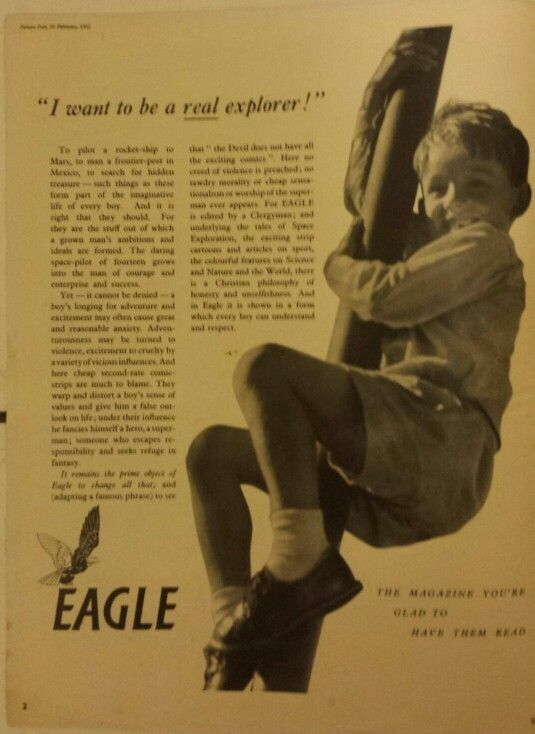 I've been surprised at the the contents of an advert for The Eagle comic inside a copy of Picture Post from 1952. To pilot a rocket-ship to Mars, to man a frontier-post in Mexico, to search for hidden treasure - such things as these form part of the imaginative life of every boy. And it is right that they should. For they are the stuff out of which grows a man's ambitions and ideals are formed. The daring space-pilot of fourteen grows into the man of courage and enterprise and success. Yet - it cannot be denied - a boy's longing for adventure and excitement may often cause great and reasonable anxiety. Adventurousness may be turned to violence, excitement to cruelty by a variety of vicious influences. And here cheap second-rate comic-strips are much to blame. They warp and distort a boy's sense of values and give him a false outlook on life; under their influence he fancies himself a hero, a superman; someone who escapes responsibility and seeks refuge in fantasy. It remains the prime object of Eagle to change all that and (adapting a famous phrase) to see that "the Devil does not have all the exciting comics". Here no creed of violence is preached; no tawdry morality or cheap sensationalism or worship of the superman ever appears. For EAGLE is edited by a Clergyman; and underlying the tales of space Exploration, the exciting strip cartoons and articles on sport, the colourful features on Science and Nature and the World, there is a Christian philosophy of honesty and unselfishness. And in Eagle it is shown in a form which every boy can understand and respect. Eagle - The magazine you're glad to have them read. I had no idea that Eagle was set up to stop "cheap second-rate comics-strips" from "warp(ing) and distorting a boy's sense of values". Is it true? Was the "prime objective of Eagle" to see that "the Devil does not have all the exciting comics"? If it's any help you can read something of the climate in which Eagle was launched in these two entries from my rather moribund attempt at a blog 'Things That Grip!'. I'm afraid so. Sadly they seem to have believed the anti-American comics propaganda that was starting to surface after the war. Luckily, Eagle turned out to be a top quality product so we can forgive the paranoia that led to its creation. That ad is amusing though. Good find! "the Devil does not have all the exciting comics". Although he's probably gained a few more for his collection since he invented comics piracy. I remember reading that Hulton Press wanted Marcus Morris to get rid of the religious strip, which I think was at the top of the back page of issue 1. Morris told them in no uncertain terms that if they refused to print the comic with that strip he would withdraw The Eagle altogether. I bought that the day it came out, but I had had to persuade my father that the centre-page cutaway was educational. I was really only interested in Dan Dare but surprisingly he accepted my argument despite his entrenched views that what he referred to as penny dreadfuls were rubbish. The funny thing is that Eagle started reprinting American comics towards the end of its run! The Book and Magazine Collector I picked up on Sunday mentioned that the reverend Marcus Morris took a dummy copy of The Eagle to Fleetway first of all but they turned it down. When it became popular they regretted their decision and launched the Lion with Captain Condor on the cover as a rival. But on much cheaper paper. Books, thanks for bringing that one up. As a long standing fan, I did think that most comic aficionados knew that The Eagle was designed to be a moral bulwark against the tawdry American imports, but that's just my perceptions showing. I am surprised that this was such a big selling point 2 years after the launch as those that watch the Arena documentary celebrating the 50th anniversary in 1988 would know, if anecdotal evidence is to be believed, that many kids of the 1950's preferred The Beano for its' anarchic fare as opposed to the moral rectitude of The Eagle. Either way, it's a fascinating insight into the views of the social mores of the era. I think this is a view from an adult's perspective. I really don't think that children buying The Eagle at any time during that first year will have noticed any moral bulwarks because they will have been far too busy enjoying the adventures of Dan Dare, P.C. 49, Jeff Arnold and the Riders of the Range, Sergeant Luck of the Legion, Tommy Walls, (where they will have noticed the less than subliminal advertising element), and Harris Tweed (where they won't have), and gazing in awe at the cutaways. They will probably have read the first instalment of the life of St. Paul, and made a mental note not to read any more. No problems colcool007, your definately right about this insight into moral views. It had never crossed my mind that there was this negative attitude towards these comics. I can't recall anytime reading comics for moral purposes or anyone from my teachers, parents, family or friends parents etc discouraging reading of comics, but then, perhaps it is just me being a child of the 1990s? Indeed at school, I felt a very lucky kid during wet play days where I would find comics that I didn't have at home (normally comics from the last few years that the schoool must have accumulated and shoved in the wet play drawer). I remeber being in Year 6 and our maths teacher tried to teach us the concept of inflation by counting the number of pages in comics and dividing the cover priced by the page numbers. I got poor marks as I was far more interested in reading these comics and asking if I could have them! They year was 1997, I was 10 years old and actually holding a comic from the 1980s was mind blowing. In a book published in 1949 Geoffrey Trease began something of a witch-hunt against Enid Blyton, of all people, whom he accused of polluting children's minds with anodyne fantasies which left them ill-equipped to deal with the real world. Ending Blyton of all people? Here's me thinking that this era was generally considered the golden era of childrens books! Phoenix, you're right. This is why I said it was designed in that manner by the Reverend Marcus Morris. I didn't think we had child labour in the design team at Odhams Press, in the 1950's, apart from the odd apprentice! After all, like most of the comics of the time, it was aimed at children, but written and drawn by adults. I believe it was Wilf Self that said that The Eagle was the comic that parents wanted their children to read, but the Beano and Dandy were the comics that the kids themselves wanted to read. From the examples I have seen, The Eagle was technically superior, but always struck me as cut off from the artistic imagination that spawned it. While the Beano and Dandy of the time was so full of verve and energy, it is no surprise, to me, that they seemed to be the preferred option. Alas, as ComicsUK only has two or three members that were in the target audience at the time (I'm not saying who's that old as it is far too early to get anyone THAT grumpy! ), we do not really have a large enough sample group to present a statistically significant answer. This is why I said it was designed in that manner by the Reverend Marcus Morris. I didn't think we had child labour in the design team at Odhams Press, in the 1950's, apart from the odd apprentice! I know perfectly well what Morris's thinking was. The attempted humour in your second sentence does have some value though because by removing children from the design and creation process your expression comics aficionados is clearly intended to refer to adults, either in the here and now or the there and then, many of whom at the time could well have been aware of Morris's aims. On the other hand, children, the target readership, will not have been reading newspapers, or listening to boring discussions on the wireless about the matter, but they will have been excited by the pre-launch adverts. Those children were the real comics aficionados, and they bought The Eagle in their thousands, and the fact that it lasted for over nineteen years, albeit with a reducing readership, is testament to the attraction of its content. Whether the same children or other children found The Dandy and The Beano more to their liking is really neither here nor there because we all tended to read each other's comics. Ending Blyton of all people? The book that I think Phil was referring to is Tales Out Of School. My copy is the 1965 reprint of the Second Edition. Trease does acknowledge that The Naughtiest Girl In The School is an example of Miss Blyton's school fiction at its best, but the comment recalls Alexander Pope's phrase damn with faint praise in his Epistle To Doctor Arbuthnot. In his attempt to estimate her influence, Trease says that if the only criteria on which to base a judgement are her sales and her popularity with younger children, her books must be the best children's books in Britain, if not the world. He goes on to say, and I quote, Few people over ten would seriously suggest that they were. There is, on the contrary, a widespread tendency to dismiss them in educational and library circles. One children's librarian spoke to me, with feeling, of their 'intense mediocrity', and Dorothy Neal White, in her otherwise excellent survey, ignores their existence.